Flip Out Mama: Fisher Price Giggle Gang Makes My Heart Happy! Fisher Price Giggle Gang Makes My Heart Happy! As you guys know, our family LOVES Fisher Price products. If I had to pick a single brand as my family's favorite, it would have to be them! Fisher Price makes really durable, cute, and fun toys that I know my kids will enjoy (even the big one! )So, anytime we have a chance to work with them, I am always ready for it! This time around, we got the chance to check out a new product line called the Giggle Gang! These little guys are SO cute! 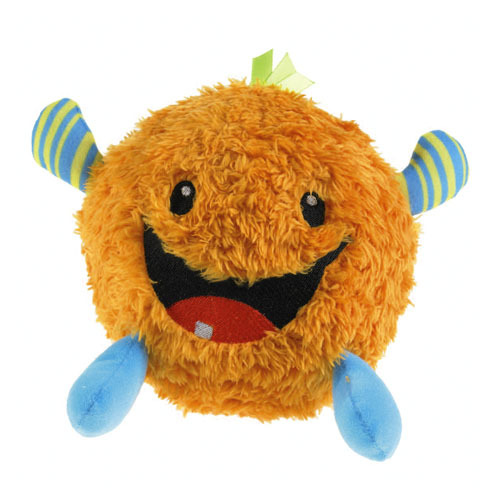 They are soft, round plush toys, but they have a twist. When your baby squeezes or shakes them, they each let out their own funny, adorable giggle! They are the sweetest thing! I didn't know how Bean would react to these, since he is getting bigger these days. These are recommended for six months and up, so I thought he might be too big! I was wrong! He LOVES his little Giggle Gang guy.. In fact, he calls it "HIS BABY!" How cute is that!? He carries it around all the time, and every time it laughs, he laughs! 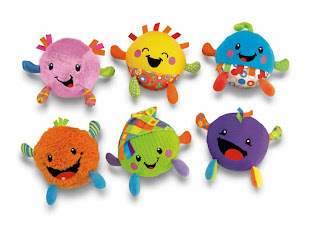 I would definitely recommend the Fisher Price Giggle Gang for the baby/toddler in your life! You will love having a "noise making" toy that doesn't drive you nuts! Who doesn't love a baby's giggle?!? The Fisher Price Giggle Gang retail for around $12.99 each, and you can check them out here! I was provided with a sample product in order to conduct a review of this product and give my honest opinions. No monetary compensation was received, and all opinions are 100% my own! Fisher Price Smart Tablet Review! Pacific Pillows Review and Giveaway! Plus Size Lingerie Boutique Review! Skin Smoothy = Miracle Product? I have to get my garden back . Car Seat Tips and Tricks! My Mobile Mishap Story Plus Giveaway!! Back To School Event! Seeking Sponsors! Safe Email Accounts For Kids!! Send Dad an E card from OJolie! Headline Shirts Review and Giveaway! So You Want To Own A Winery?! What would I do with a full time MBA? Review plus GIVEAWAY! Shindigz Party Supplies! My Baby Clothes Review and $25 GC Giveaway!! My Child Is A Plumbers Worst Nightmare! My Local News Just Posted This "Zombie Warning". Etsy Review! Catju Designs Artisan Jewelry!